The two southern coastal keeps are on low ground, the two northern keeps are on high ground and therefore not suitable for moat digging AI's. I'd recommend to site yourself in the south-west coastal keep and fight against three allied AI opponents, giving them a gold advantage. how u make ur men purple? Gemini11, the colour change was done using a Hexadecimal Editor. It's only like it is because this map is also the same landscape as an Invasion mission that I'd already re-coloured. Not sure why it won't work for you Pat, I checked it on my machine last night and it was fine ...? Great gameplay on this map! I think a "straight forward" skirmish is understating, as other strategies, such as height advantage, multiple attack points, and defence of resources come into play. Enemies were not too close or far, and skirmish AI worked wonderfully. I was attacked often, and brutally, and not always from the same direction. Very challenging! The purple motif was a nice play on words. This is one of the most "natural" looking maps I've ever seen. Lots of attention to details - this probably took a while to make. Tips and instructions were given prior to play, and while a nice addition, I don't think an in depth story line is required for skirmish maps - just let the game play speak for itself. Awsome. 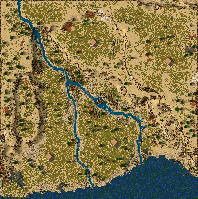 At first glance I thought all that stone and iron would make for an easy map, but with a computer gold advantage, constantly attacking enemies, and resources far from the keep made this map a fun challenge. Just want to add that you should try the invasion map version of this.Very enjoyable! I think the invasion map version of this mentioned by lorde dredde above, is called, Holiday In The Sun.